In this chapter, the leading questions of this research are introduced. Beginning with some remarks concerning the fact that, in Husserl’s texts as well as in the literature commenting these texts, the analyses concerning time and space are more often than not kept separate from one another, the question as to how we shall conceive of their relationship is formulated. After introducing the interpretation of the relationship between spatiality and temporality in terms of analogies and parallelisms, which Husserl defends in some of his texts, I briefly expose my suggestion that such an understanding may be unsatisfactory both with respect to the description of such a relationship and with respect to the thematization of its role within experience. 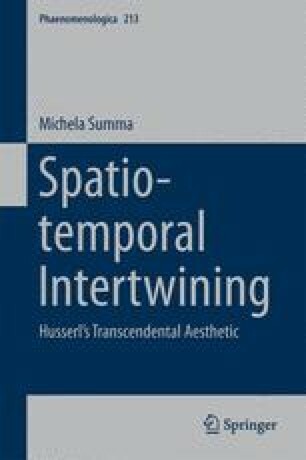 Consequently, following one insight of Husserl’s regarding the spatio-temporal configuration of experience, the hypothesis is formulated that the relationship between spatiality and temporality could be better understood as “intertwining”.